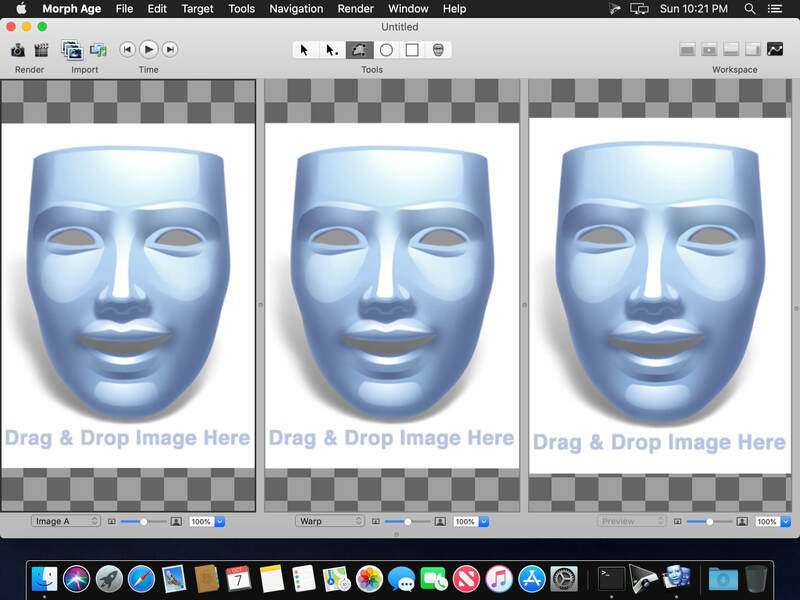 Morph Age (was Morph Age Express) is an application for morphing faces and warping images on macOS. 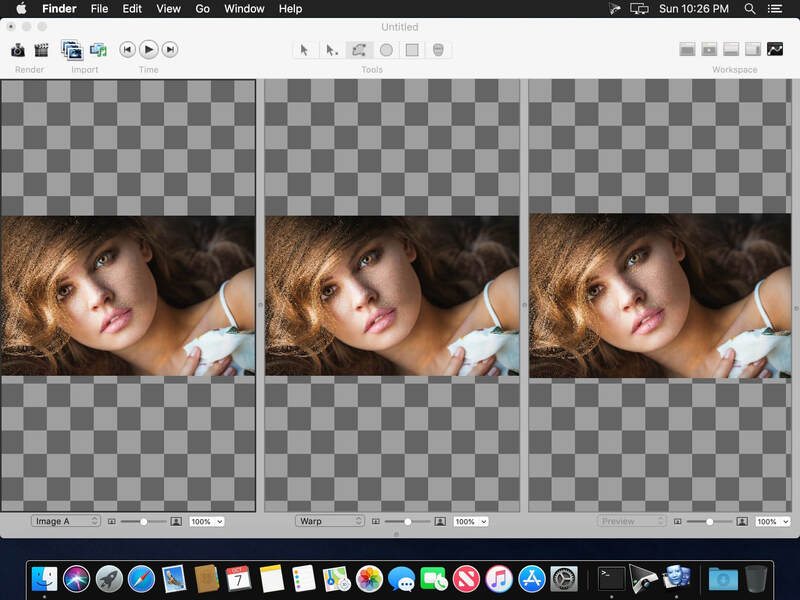 It works by allowing you to define curves on one or more images and changes based on those curves are reflected in the resulting image through the corresponding distortion and morphing effect. 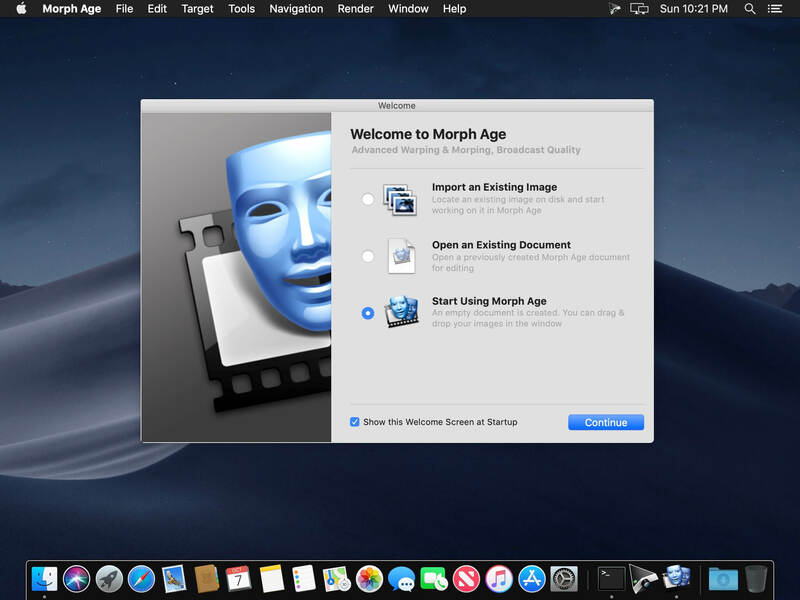 Definitely Mac - Morph Age is 100% Mac software from the start. You can import various image formats from almost any source, including direct access to your iPhoto media. You can even use your iSight camera directly from within Morph Age to import pictures. The rendered animation is in QuickTime format, enabling further composition in Final Cut Pro, iMovie, or even export it to your iOS devices! Controlling the morphing animation - Morph Age can animate warp curves independently, so that different parts of the image move at different times (the eyes, then the ears, then the mouth...). Also, animation effects are available, such as springy motion. Morph Age shows the result in real time, so that you can quickly and easily prototype the transformation. Non-linear transformations - In Morph Age, not only shapes and curves can be animated at will in a fully controlled way but also blended. Blending allows you to control what amount, or percentage, of the first image that you want to combine with the second one. Sub-pixel Accuracy - Morph Age has full support for zooming and scrolling capabilities. Through subpixel accuracy and zooming Morph Age gives you precise curve placement. This permits fine tuning of the curves that define the transformation, thus avoiding the "ghost" effect typical of morphing applications. Fine tuning of curves is seen in real-time in the interactive preview panel. Zooming - Zooming allows accurate curve placement. This is necessary as Morph Age offers sub-pixel accuracy. The real-time preview rendering can also be zoomed and can serve to assist precise curve placement. Colorizing - Morph Age has colorizing options that makes it possible for Hulk-like warp effects. This works by allowing the user to define, independently for each curve, a color that will "bleed" on the underlying image parts. This color bleeding is animated consistently with the deformation. Layers - Layers in Morph Age is a way to highlight the changes in one part of the image over others. This allows you to morph specific parts of the image over the background, giving your transitions and morphing a more realistic look. Real-time Rendering - Morph Age uses advanced GPU rendering techniques, allowing real-time preview even for large images. Click Play, and you see the morph/warp in real-time, whatever the image size. You can even move the curves that define the transformation while the animation is playing. This makes it convenient for iterative placement of curves as there is no lag in the render-cycle, making Morph Age well suited to easily and rapidly prototype the effect you want. Support for 4K video rendering. Morph Age can now produce professional video output at up to 4K resolution. Cursor misbehavior: hand cursor does not show up anymore while editing curves. Trackpad zooming gesture now effective when editing.